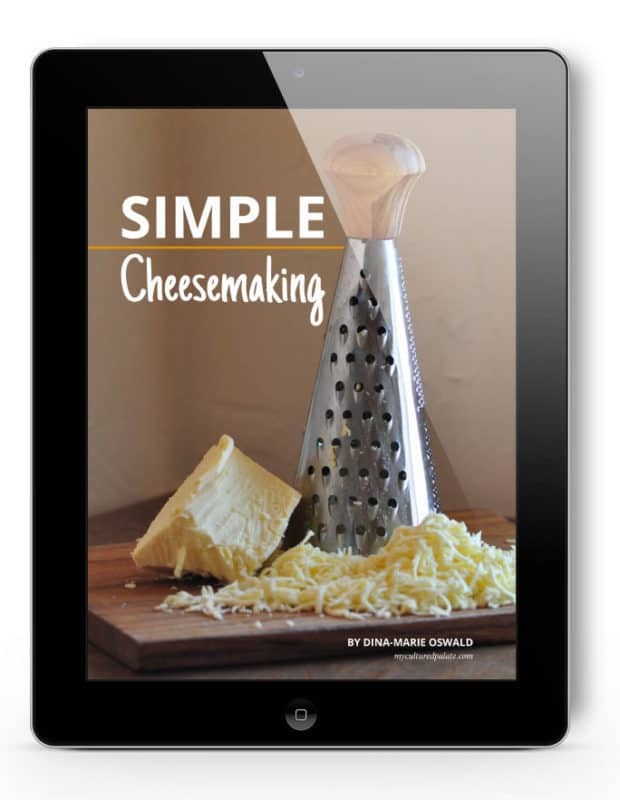 Home » Simple Cheesemaking Ebook is Here! Learn the lost art of cheesemaking with Simple Cheesemaking. Use this step by step guide which includes 32 recipes to learn how to make your own cheese. Be sure to watch the overview video below! I have shared several cheesemaking recipes here on Cultured Palate, and now, after working for months, the book is ready! I’m so excited for you all to try all these recipes!! 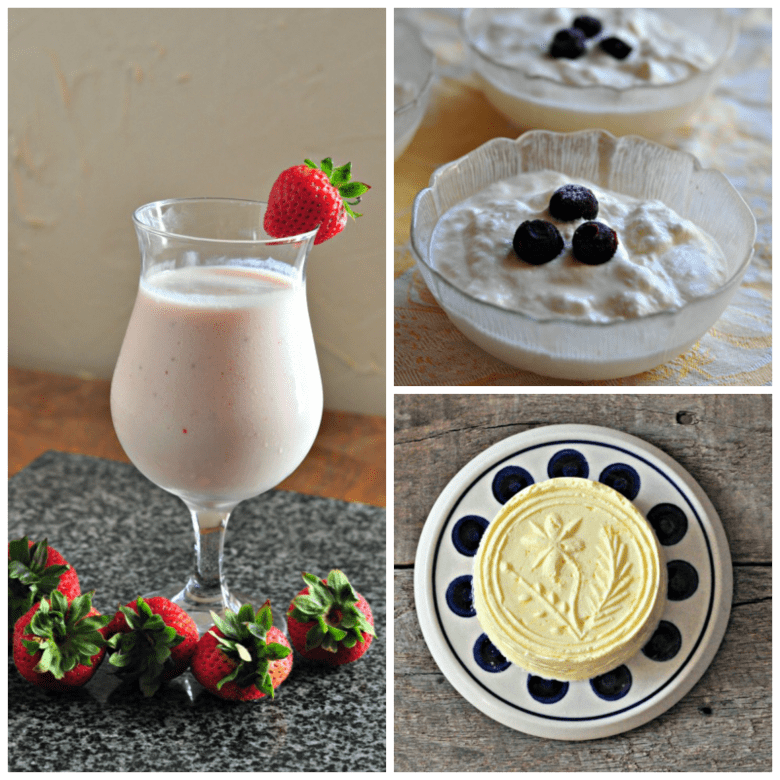 You can now have the recipes for cultured dairy products, soft cheeses (Mozzarella, Mascarpone…) and hard cheeses (Monterey Jack, Parmesan, Swiss…) that I have found to produce consistent results all in one place. You can rest easy that all of these have been tried by me and have been found to be reliable. No effects from weather or the cow mooing at the wrong time. That was a complaint of mine when I tried to replicate lots of recipes from vintage or even modern cookbooks. There was just too much to account for! So I took care to test everything that went into this book. Plus, you have information on the basics of the process, ingredients, and supplies I use. I included a list of suppliers that I use personally, but of course, you can replace anything that doesn’t work for you. My goal is to make this process easier for all the newcomers out there! There’s even a troubleshooting guide for help with common problems during the process (because goodness knows I wish I had had one when I first started working with cheese at home). 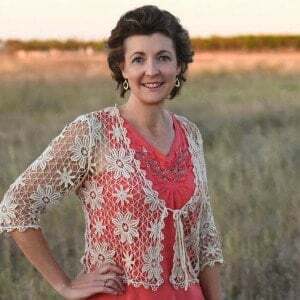 I researched and answered all the questions I had when first starting out, so you all could benefit and not have to go through the trouble I did when I first ventured into the world of cheesemaking. The first couple of years were very difficult financially – grapevines take three years to produce the first crop! We wanted to make this vineyard a reality more than anything. So we were looking for any way we could think of to save money. In trying to cut the budget, I noticed that a large portion of our monthly grocery expense was spent on dairy products. At this time, I was a vegetarian and dairy was a major source of protein. Even the meat eaters in the house were eating cheese and using milk. I began to put the pen to the paper and realized that we could keep a family milk cow for a bit less than what I was spending monthly on dairy and have way more dairy products to boot. Working directly from raw milk opens up so many possibilities! But, the only way having our own milk cow would be more economical was if I began making cheeses. So, my journey in learning to make cheese began! Trust me, there has been a lot of trial and error. There were successes and failures with every step. But now I work at making cheese regularly and am quite happy with the results. Our fridge is stocked with many different kinds of cheese on a regular basis. If possible, I want to help shorten the learning curve for you! In this book, I have taken the guesswork out of the cheesemaking process. You can start working on your own delicious cheese without having to research everything from scratch like I did. There were a lot of tiny, not-well-maintained websites where I had to look for important details! Starting with the basics of the process, Simple Cheesemaking explains the cheesemaker’s vocabulary, equipment, and ingredients. The goal is to equip you to be ready to make cheese on your own as if you were learning how to do this at a cooking school. It’s all about learning the mindset! Simple Cheesemaking brings the lost art of cheesemaking to life in an understandable, easy-to-follow book. This book is exactly what I wanted back when I was first learning how to make cheese. You will learn skills and techniques to make you a successful cheese maker in everyday life! There’s no limit to what kind of cheese you can make if you have quality milk on hand. Whether you homestead, have a family milk cow, milk goats or buy your milk, you can be a successful cheese maker right in your own kitchen! I love our fresh raw milk, but I understand that that’s not feasible for everyone. Simply do the best with the ingredients you have. And of course, play around with different recipes until you find a favorite. You will be surprised at just how easy the process of cheese making is! And, once you taste the homemade goodness of cheese, you will not want to settle for the store-bought versions again. I LOVE cheese! I’ve always been overwhelmed by the idea of trying to make it myself though. I have to admit that knowing you’ve worked your way through all trial and error ahead of me actually makes me consider that it might just be possible to do! Thanks, Alicia, I know you will be pleased with the results – it is much easier than you think! I love your story and how you began your cheese making. Does your book include recipes for making raw cheese? 🙂 If so, how many or which recipes? Thanks!! Megan, all the recipes in the book are ones I use with our raw milk! From my understanding, they can also be made with store-bought but there may be some trial and error as to which brands work. This looks like an amazing resource! I love cheese, and making it would be so much cheaper than buying high quality cheese. I have never tried to make cheese and you do make it sound easy! Linda, it really is – I hope you will give it a try! Love this! I am a huge fan of cheese but have never made any of my own. What a great idea! Congratulations on your new book! I wish I could tolerate dairy better or I’d be all over this. However, I will be sharing with people I know who want to make their own cheese. Thanks, Loriel, I appreciate it! Can I buy your book in hard copy? JC, sorry but it is on available for download. I’ve tried cheddar in the past but it always gets mold before it is aged enough. Do you cover this problem in the book? Also what kind of starters/cultures do you use? Thanks! Katrina, I do have a trouble-shooting guide included in the book. Cheddar is one of our favorites. If it is getting mold on it, it has probably not been pressed enough – I would try increasing the amount of pressure you are using in your cheese press. There is an aspect of trial and error in cheesemaking b/c of different humidity levels…As long as it is not much, you can also trim it off. I would not do this if the mold goes all the way through the cheese or has a funny taste – that is indicative of another type of bacteria. Think of the cheeses that actually have mold on the outside – this is normal to a degree. But, cheddar as a rule, should be able to age without the mold. Let me know if you have any other questions.